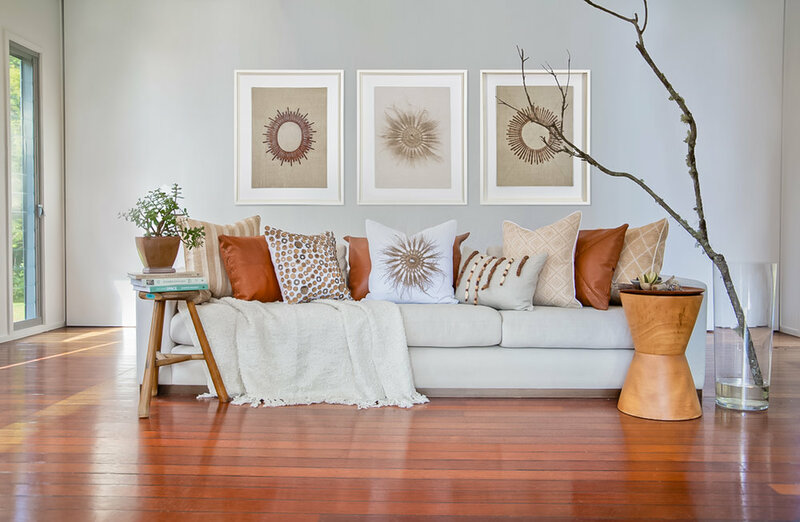 Bandhini Homewear Design, based in Queensland, create eco-friendly soft furnishings and textiles which embrace the Eastern ways without the use of heavy petrol based machinery with the idea that their product will gently return to the earth. Their range is designed in house and made in India by skilled artisans with unmatched attention to detail and unique offerings. Their current collection consists of cushions, quilts, throws and artwork with offer design services to provide custom artwork, quilts, throws, table linens and cushions for commercial projects. Need help visualising your cushions selections on your bed or sofa? Have a large commercial job and need to ensure the palate works across each application? Let us know what product you are intrested in and we will have a custom storyboard made up for you to visualise the finished result. Bandhini have the ability to customise any of their cushions into framed or stretched canvas artworks with or without statement applique. Available in 3 sizes or customise to your specific size. See also their range of ready made artworks, ready to purchase from their website. Select from a range of sizes including Lounge, Lumber, Euro, Sham, Rectangle in a range of styles including Indoor and Outdoor. These luxury cushions are designed by the team at Bandhini, printed with Silks, Linens and embellished with Hand Embroidery and appliqués.